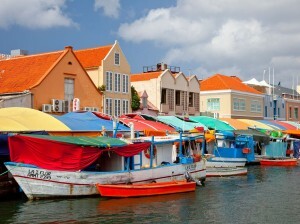 WILLEMSTAD - The Venezuelan fruit boats will return to their old location. This move will take place on August 6. Now they are still docked at the Kleine Werf. The market on the Sha Casprileskade had to be renovated and Curaçao had other plans for the fruit market after the trade blockade of President Maduro. But now everything will remain the same. The fruit boats from Venezuela has been on that location for 100 years.